Taste of Iceland has taken over Chicago for a four-day festival of Icelandic cuisine, art and culture. 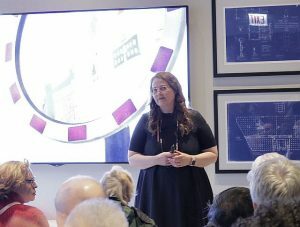 Among the events was an architecture talk and vodka tasting at Marshall’s Landing in Chicago’s Merchandise Mart. The Mart overlooks a splendid view of the riverfront with examples of Chicago’s own stunning architecture just outside the window. There, we visited a presentation by Halla Helgadottir, Managing Director of the Iceland Design Centre Museum in Reykjavik, Iceland. The Centre has the distinction of being the most visited museum “per capita” of any museum in the world, the joke being that with Iceland’s small population it is estimated that more than 10% of the nation has visited the museum. 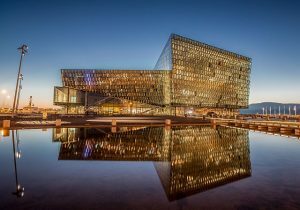 Helgadottir shared photos of several of Iceland’s architectural points of interest including the Harpa Concert Hall whose exterior looks as though it has been chiseled out of a giant sold piece of crystal clear ice. Harpa Concert Hall, an example of Iceland architecture. Design Centre photo. Iceland. Conversely, there was a photo of a farm house that was built largely underground and was reminiscent of the dugouts built by prairie pioneers in Kansas and other parts of the Midwest during the great westward expansion in the U.S.
Like the prairie pioneers, the Icelanders have precious little wood so alternative building options are required.